This month had been eventful; I had a week long trip in Japan and took so many pictures I have yet to really process it. Also, catching up on work after a long break is definitely no easy feat, it took me half a day just to clear my inbox! Somehow though, I manage to finally kick start my baking adventures this weekend. It was not easy as everything is not at hand and I have to dig it out, clean it and start using it. But oh boy, was it worth it. Since I have started into a healthy regime of sort, I have been looking out for interesting healthy food options. Contrary to the popular believe, I actually found that food which is good for you do taste good as well. Just like the Lui Cha that I mentioned before, all goodness pack into a bowl with plethora of taste and textures, I found another love in muesli. Muesli stirred into plain fresh yogurt is an absolute heaven to start your day with. This was what I had frequently at work for breakfast, and as expected, I had mixed responses from fellow colleagues. Some do not even recognize what I am having, some cheered me for my good healthy choice while some salute me for being able to stomach it. Well I do agree that muesli is not exactly a normal breakfast fare for Malaysians, where we consume in abundance breakfasts like Nasi Lemak, Roti Canai, roti bakar (toast bread) with eggs, Wan Tan Mee (dried soy sauce noodles) and so on. With such indulging choices for breakfasts here, it is no wondered nobody ventured out further than that. Of course we also do consume cereals and fresh milk at home apart from the usual bread with kaya, thanks to the heavy advertising by the giants bout 10 years ago but the idea of muesli and yogurt is still lost to many. For me, I thank the wonderful world of food blogging for introducing me to this seriously good, taste and health wise, food. It was also superbly convenient to have whenever you need a fulfilling breakfast or a quick healthy snack. Ever since I have been consuming packaged muesli, I have been in awe of those who make their own mueslis or granolas. Ok wait, what is the difference between them? I am quite confused at first but from a quick read in Wiki here and here, I conclude that muesli are simply mixed grains, nuts and fruits while granola is a baked version of them. Correct me if I am wrong here, but anyhow, they both serves pretty much the same to me, crunchy goodness of oats, nuts and fruits all in one. The batch of granola I made was crunchy and fragrant; as expected. Just like many bloggers have mentioned, after you make your own, you find that it is so easy and tasted so good, why would one ever go back to buy packaged one? So if you are one like me who found love in muesli or granola, do try to make one at home or if you are one who have yet to understand its delicious goodness, try it and be converted! I had used recipes from various bloggers as guidelines to come up with my own version. Thanks to my limited supplies, I was just planning to try out so I did not splurge much on fruits and nut, I made a really simple version of granola. You would notice that halfway through I stirred in ground flaxseed, this is because I totally forgot about until the granola had started baking in the oven, and I had to ground my whole flaxseed then before I can use it. This is my currently working version where I would continue to refine and innovate to come out with an ultimate granola! 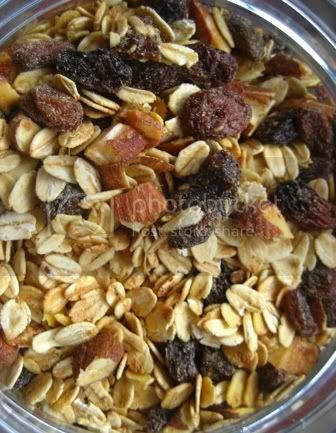 Mix all the dry ingredients together – oats, raisins and chopped almond. Pour the dry ingredients onto prepared parchment paper on a tray. Mix the honey, water and oil and then slowly stir into the mixture bit by bit. Mix very well until everything is a bit moist and clumps together a bit. Roast in the oven at 200°C for 30 minutes. Stir it about every ten minutes. Halfway through, stir in ½ cup of ground flaxseed for good measure! When done, take it out and let completely cool before storing in airtight container. Tip: serve ½ cup of granola stir into 1 cup of yogurt or milk or soy milk of your choice. Update: Today while munching on my granola I found that some of my raisins were actually burnt, so I would advice to add in raisins maybe halfway through the baking.